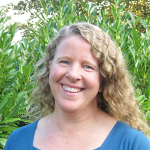 Amy Howell is an occupational therapist specializing in a very gentle but highly effective form of myofascial release. It is her desire and mission to assist her patients in achieving their optimal desired level of health, well-being, and active lifestyle from any starting point. She uses gentle myofascial release to assist her patients in finding their individual path to whole mind/body wellness in ways that our current healthcare system does not generally address. Do you know what fascia is or how it affects your posture, overall health, and pain issues? Do you know that there are things you can do at home to treat your pain? Amy can teach you! Read more about gentle myofascial release the way Amy practices it. Although her training as an occupational therapist was extensive, it left Amy with only a small tool box to help patients treat pain symptoms, and nothing to help take the pain away. In OT school, she had only learned that fascia was the “packaging that held us together” and was told to “cut it away and find the important things underneath.” Nothing could be further from the truth. Fascia is an amazing whole-body system that affects all aspects of our health. See for yourself: See living fascia under digital microphotography on YouTube. Amy’s love for Myofascial Release began in 2009 with her first class with John F. Barnes… This was preceded by 15 years working in traditional and private therapy settings, which has given her a broad knowledge of what the current healthcare system does and doesn’t have to offer. In all her experience, she has not found a more effective approach in making lasting changes that truly improves people’s quality of life. She continues to be fascinated with the consistent results both for herself and for her patients. “In 2009, I was in a severe car accident. Being rear-ended on the freeway at 70 mph resulted in injuries that kept me from working for over 5 months. Thankfully, I received weekly treatments from an expert level John F. Barnes Myofascial Release therapist and I can now say that I am fully back to my normal self. Actually, I am better than that!” Myofascial Release not only helped her to relieve pain and restore posture and motion, but also helped with the ability to let go of the trauma of the accident, which was an underlying cause of her daily exhaustion. Amy shares that her energy and enthusiasm for life returned! Joining the Heart of Wellness team has been extremely rewarding for Amy as she’s had the opportunity to work closely with highly skilled clinicians in a natural medicine setting. When treating a patient, Amy looks at all aspects of each person as an individual and support them with the holistic approach of Gentle Myofascial Release. This allows patients to access their own natural healing wisdom and supports the body to heal itself. Science is now catching up in understanding the fascia and how myofascial release works, but words alone cannot describe the experience. Amy invites you to come and experience the tremendous relief and well-being myofascial release can bring to you. Amy can be seen at the Heart of Wellness clinic in Tumwater, WA. If you’d like to schedule an appointment, please call 360-570-0401. Don’t wait! Amy’s appointments tend to fill up weeks in advance. Amy is a preferred provider in nearly all insurance networks. We also have self-pay rates if you do not have health insurance benefits for occupational therapy. Amy’s usual self-pay initial visits are $135 and her usual return visits are $90. Not sure if your insurance has occupational therapy benefits? Call us at 360-570-0401 and we will help breakdown your benefits for you. In addition, please verify benefits directly with your insurance payer. Additional Questions? Call to set up a risk-free 15-minute initial consultation with Amy.